InFlow is a cloud-based sales and inventory platform used to manage and track your orders and stocks. It integrates with your financials for a seamless sale and stock budgeting. The sales software is targeted at small and mid-sized businesses; the vendor claims to have served 500,000 businesses with their previous software, inFlow. Using InFlow frees you from repeating tedious tasks when processing orders, from receiving and shipping them to collecting receivables and replenishing stocks. The whole process is automated so you can see at once what to ship, invoice, or purchase. You and your sales team and finance people can also work more closely together with real-time data. Furthermore, you can collaborate together with the customer and vendor for customized orders. This setup speeds up special orders from special clients by keeping everyone in the loop. InFlow works with popular browsers like Chrome, IE, Firefox, and Safari. A mobile app is being developed; in the meantime, mobile browsers can work as well. There are popular and widely used systems in each software group. But are they essentially the best fit for your company’s specific requirements? A popular software application may have thousands of users, but does it provide what you need? For this reason, do not blindly invest in popular systems. 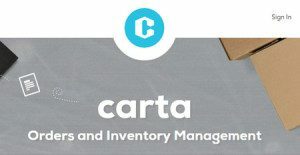 Read at least a few Carta reviews and think about the elements that you desire in the software such as the fees, main functionality, available integrations etc. Then, choose a few apps that fit your requirements. Try out the free trials of these platforms, read online reviews, get explanations from the seller, and do your research meticulously. This exhaustive homework is certain to assist you choose the most excellent software platform for your firm’s specific requirements. How Much Does InFlow Cost? We realize that when you make a decision to buy Sales Software it’s important not only to see how experts evaluate it in their reviews, but also to find out if the real people and companies that buy it are actually satisfied with the product. That’s why we’ve created our behavior-based Customer Satisfaction Algorithm™ that gathers customer reviews, comments and InFlow reviews across a wide range of social media sites. The data is then presented in an easy to digest form showing how many people had positive and negative experience with InFlow. With that information at hand you should be equipped to make an informed buying decision that you won’t regret. What are InFlow pricing details? What integrations are available for InFlow? If you need more information about InFlow or you simply have a question let us know what you need and we’ll forward your request directly to the vendor.